This is a great quality 14K Gold 6 inch evil eye ID bracelet. This is fine jewelry designed to last! This evil eye bracelet measures 6 inches from left to right. The lucky eye beads measure 4.4mm in width. The ID bar measures 1 inch long and 6mm in width. 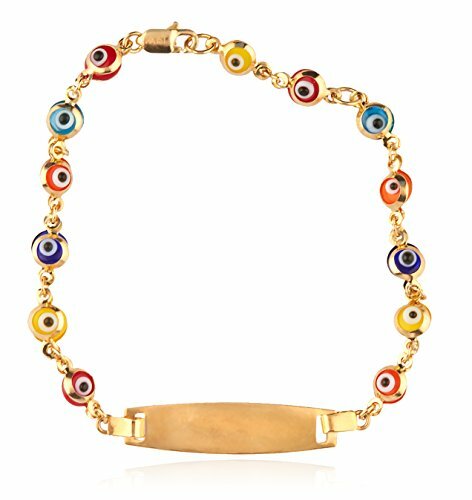 14K GOLD JEWELRY: This evil eye bracelet is crafted with 14K Yellow Gold. The color will never change and this is a piece of jewelry that will be a part of your collection for years to come. GREAT FOR EVERYDAY WEAR: This Gold bracelet is comfortable to wear everyday. It is suitable for boys and girls. The lobster claw clasp will keep this Gold jewelry securely worn on their wrist. If you have any questions about this product by JOTW, contact us by completing and submitting the form below. If you are looking for a specif part number, please include it with your message. Fine 14k Gold Religious Cross ID Bracelet with Evil Eye 5.5"
Fine 14k Two-Tone Gold Baby ID Bracelet with Blue Evil Eye 5.5"
Polished 14k Gold Dainty Blue Evil Eye Baby Bracelet 5.5"
Polished 14k Gold Religious Cross ID Baby Bracelet with Blue Evil Eye 5.5"
Fine 14k Gold Baby ID Bracelet with Evil Eye 5.5"
Polished 14k Gold Dainty Blue Evil Eye Baby Bracelet with Figaro Chain Link 5.5"
Fine 14k Gold Baby ID Bracelet with Cross Crucifix 5.5"